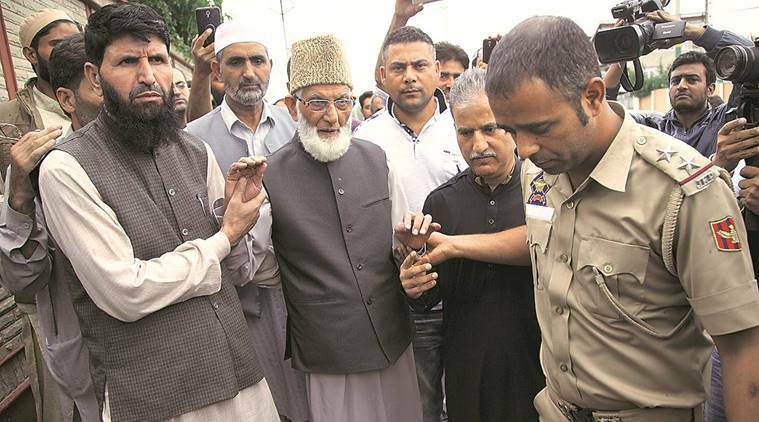 Syed Ali Geelani, chairman of Hurriyat and other members of the resistance leadership along with Heads of 13 key trade organizations declined to meet an all-party delegation, visiting the troubled Kashmir Valley today, Sunday 4th September. The killing of Burhan Wani, a commander of Kashmir-based Hizbul Mujahideen on 8th July 2016 during a gun battle with government forces sparked a renewed call for freedom from India with ongoing demonstrations and marches. Wani is now viewed as a martyr with his death only increasing unrest throughout the region. As the BBC reported, “Wani, 22, is largely credited with reviving and legitimising the image of militancy in Muslim-majority Indian-administered Kashmir.” India has responded to the unrest with curfews, detentions, tear gas, beatings, bullets and pellet guns leading to 70 deaths and nearly 10,000 injuries including women and children. Reacting to the PDP President Mehbooa Mufti’s invitation for meeting the Indian Parliamentary delegation, resistance leadership Syed Ali Geelani, Mirwaiz Umar Farooq and Mohammad Yasin Malik in a joint statement has said that Nobody is more aware than Mehbooba Ji that the Indian war machine is on a spree to kill, maim and disfigure an entire population into complete submission for demanding freedom from Indian occupation which is the birthright of all human beings. Unfortunately Indian occupation forces in J&K have a fig-leaf available in the shape of a quisling government fronted by her with the only brief to provide a civilian mask to a brutal military occupation. Despite killings and injuries of war-proportions she continues to perform shamelessly this role of obfuscation. They further said that given this situation it is not surprising that even now her dominant concern, as expressed in her letter, is to “lend credence and credibility“ to the Indian Parliamentary Delegation visiting Kashmir avowedly to ascertain wishes of the people. Everyone knows that people have been shouting AZADI on the roads for those who want to listen and writing on walls and placards for those who can see. The dirty ambitions of the collaborators and their masters in Delhi have turned them deaf and blind. While commenting on Mehbooba Ji’s outburst a few days, the resistance leadership said that the sickness of her mind touched a new low when she recently tried to justify the Indian brutalities by saying that Kashmiri boys don’t go out to the camps with milk and toffees; that seemed to even embarrass her Indian boss sitting beside. They should not have forgotten that a terrorised population cannot greet an occupation army but with stones. Resistance leaders Syed Ali Geelani, Mirwaiz Umar Farooq and Mohammad Yasin Malik said that Indian engagement with the people of Jammu and Kashmir has been only through state violence perpetrated through these armed forces that have killed close to a lakh and brutalised all of the population. In politics India has deployed deceit, double talk, themselves and through their quislings, continuously for the past 70 years. These deceitful methods of crisis management through Parliamentary Delegations and Track-II only prolong the sufferings of the people and can`t take the place of a genuine transparent agenda-based dialogue to address the core issue of the Peoples` right to self-determination in Jammu and Kashmir. That has been our consistent stand and has been spelled out recently as well in our letters to various international and global fora. They once again clarified that one fails to understand what hope to attach with a delegation which has neither spelled out its mandate for any engagement on a clear agenda. People know that it is the same parliament which has given unfettered powers to their occupying force to use violence to hold Jammu and Kashmir forcibly with India against all norms of civilised behaviour and international law resulting in death, destruction, collective punishments and humiliation.